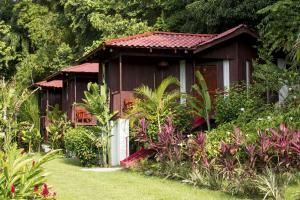 ﻿ Best Price on Manuel Antonio Hostel Resort in Quepos + Reviews! Offering a terrace and views of the garden, Que Tuanis Hostal is located in Manuel Antonio, Quepos, 5 minutes away by car from Manuel Antonio public beach and Manuel National Park. The spacious rooms are designed to offer comfort and a rustic feeling. Rooms are fitted with a private bathroom with a bath or shower, with free toiletries and a hair dryer provided. The flora and fauna Hostel Que Tuanis offers, gives you a feeling of being in the middle of the jungle. The colorful customs of red macaws on the trees, howler and titi monkeys, a variety of birds and butterflies passing through out the green areas, make this place an unique oasis full of wild life. There is a 24-hour front desk at the property, private parking with 24-hour security, floor/ceiling fans and A/C. The spacious social area has pool tables, hammocks, couches, 20MB wifi and walking distance green areas where mostly people relax and enjoy nature. 10 minutes away from Quepos airport. A prepayment deposit via PayPal is required to secure your reservation. The property will contact you after you book to provide any instructions. Please note that children from 0 to 6 years old stay for free. 7 year old and older guests pay as adults.